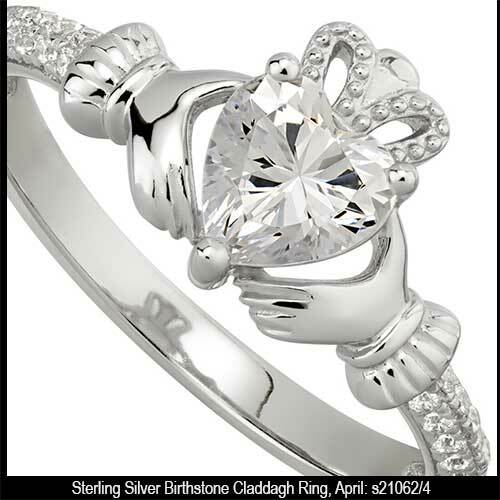 Claddagh ring is cast in sterling silver; it is accented with CZ stones in the cuffs and crown along with the open heart. 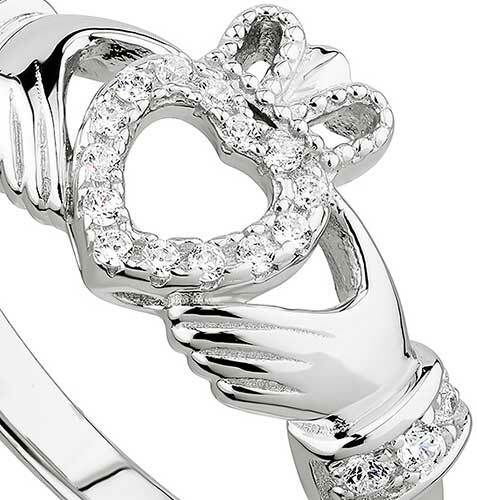 Sterling silver Claddagh ring features a double heart design. 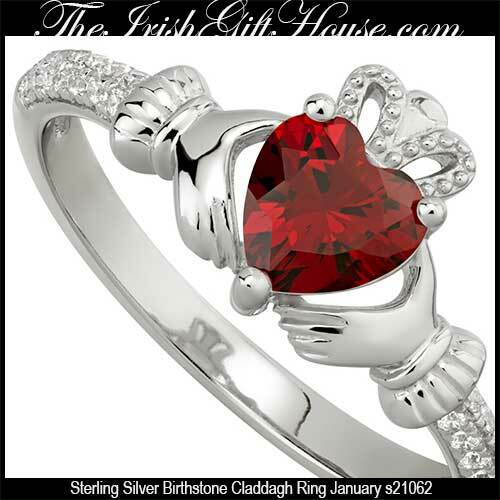 Garnet Claddagh ring features sterling silver construction; its birthstone heart represents the month of January. 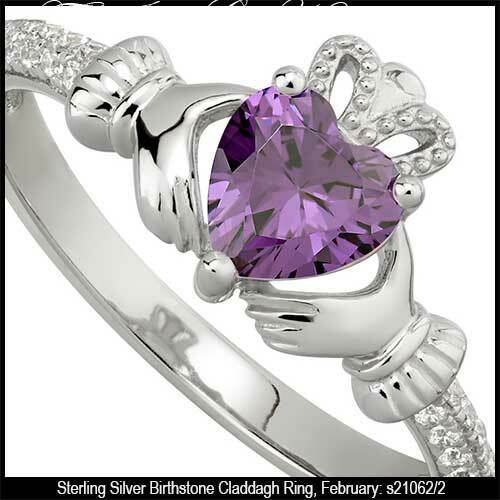 Amethyst Claddagh ring features sterling silver construction; its birthstone heart represents the month of February. 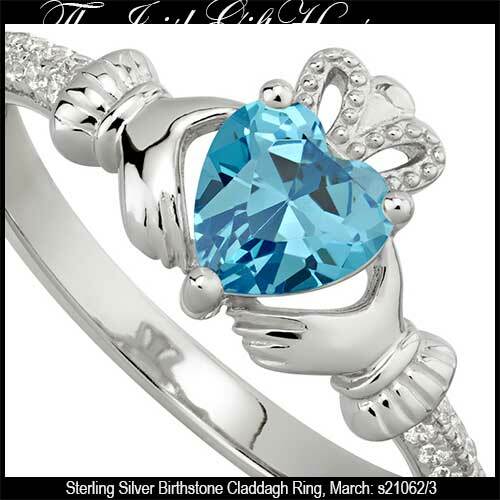 Aquamarine Claddagh ring features sterling silver construction; its birthstone heart represents the month of March. 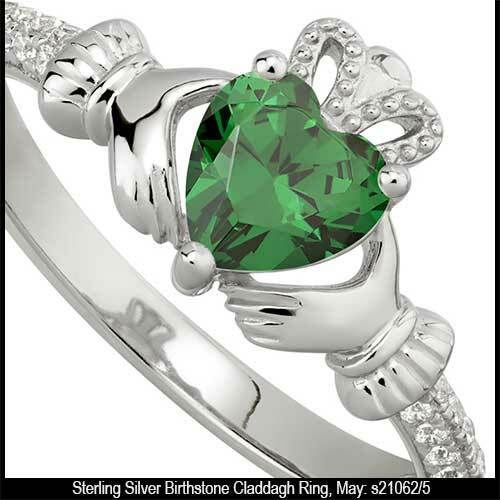 Sterling silver birthstone Claddagh ring features a crystal heart representing the month of April. Light color amethyst Claddagh ring features sterling silver construction; its birthstone heart represents the month of June. 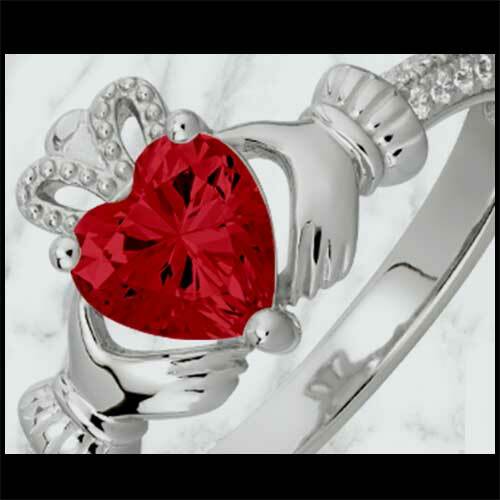 Ruby Claddagh ring features sterling silver construction; its birthstone heart represents the month of July. 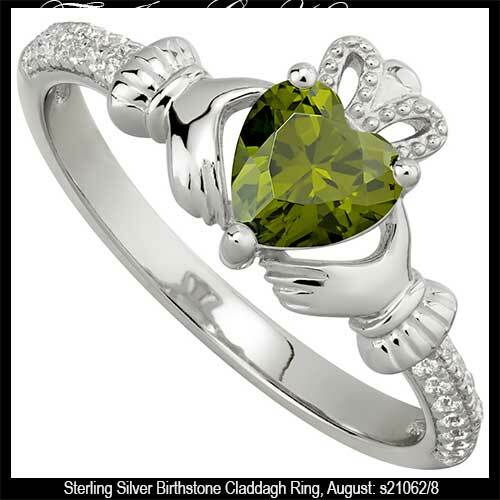 Peridot Claddagh ring features sterling silver construction; its birthstone heart represents the month of August. 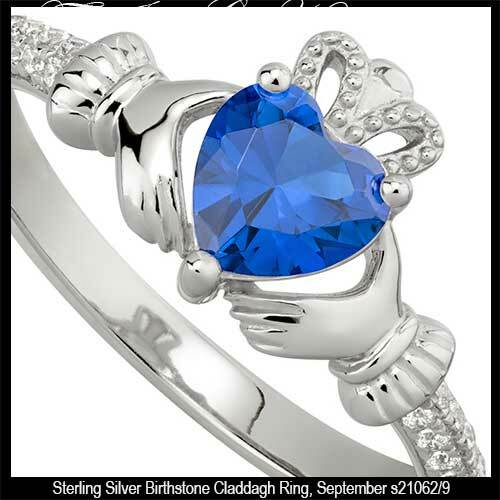 Sapphire Claddagh ring features sterling silver construction; its birthstone heart represents the month of September. 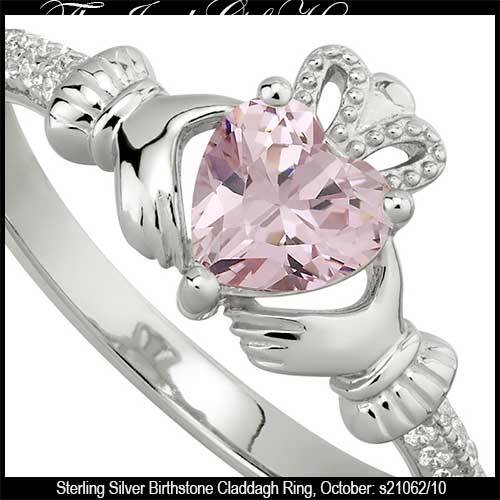 Tourmaline Claddagh ring features sterling silver construction; its birthstone heart represents the month of October. Citrine Claddagh ring features sterling silver construction; its birthstone heart represents the month of November. 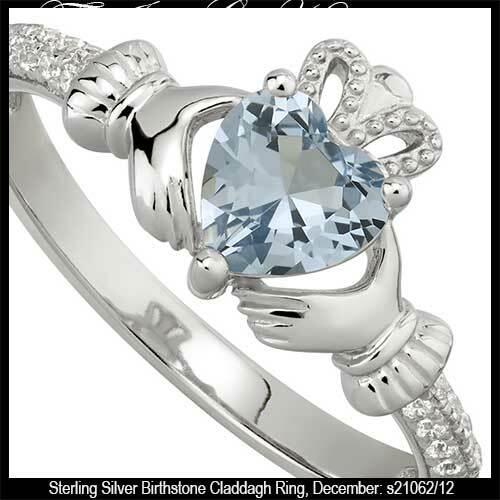 Topaz Claddagh ring features sterling silver construction; its birthstone heart represents the month of December. 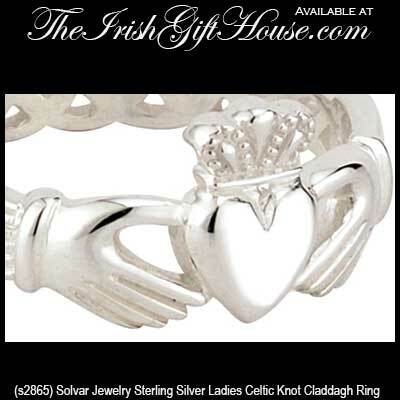 For additional women's sizes and styles in silver you may want to browse our Claddagh wedding rings section that has several options for both ladies and gentlemen; however we also have a complete section dedicated just for the guys that is entitled men's Claddagh rings. In this section you will find both gold and silver versions of the iconic Irish symbol. You may also wish to visit some of our other related sections on our site. The Irish Gift House stocks a large assortment of sterling silver Claddagh earrings along with sterling silver Claddagh necklaces so you will be able to purchase several complimenting pieces of Irish jewelry. You don't need to get them all today; there is always another day for celebrating with the perfect Irish gift just around the corner and we will be waiting to serve you when you are ready. 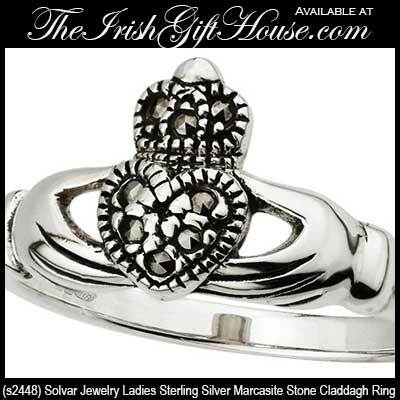 Our collection of sterling silver Claddagh rings for women are made in Ireland by Solvar Jewelry, O'Connor, TJH and Cailin Jewelry.